We’d set both of our phone alarms to go off at 6.30 after spending a week getting our wake up time earlier than usual. Which of course involved going to bed earlier than 2am every day. And believe it or not, we were both awake at 5.30 and decided to get the show on the road. We enjoyed a peaceful early breakfast of a little toast and honey and 2 cuppas before heading out the door, and did our usual, of driving to my in-laws to say farewell to them, and then catching a taxi the short remaining distance to the airport. Once we’re in that taxi it feels as if the adventure is beginning! The flight was as smooth as silk and went so quickly! Well, 3½ hours is a very short flight anyway, and the meal (thank you Qantas!) helps to fill some time too. 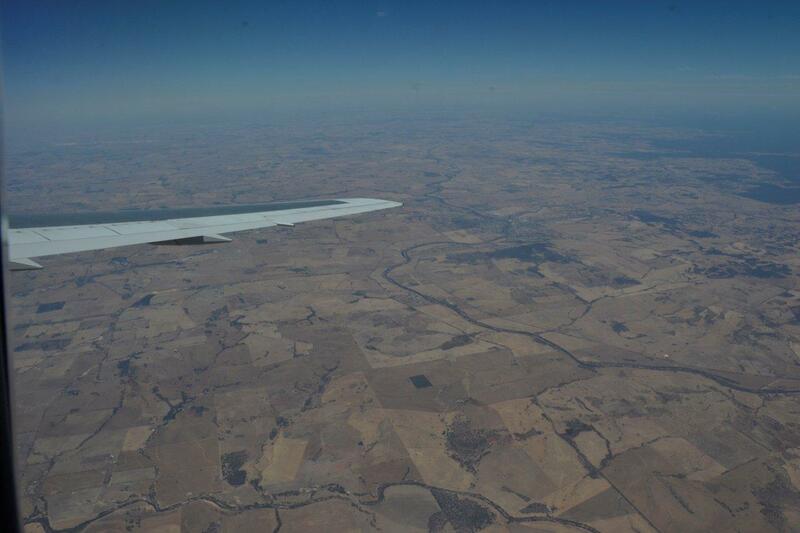 Here’s the difference between dry, brown country WA from the air compared to green, lush Victoria. 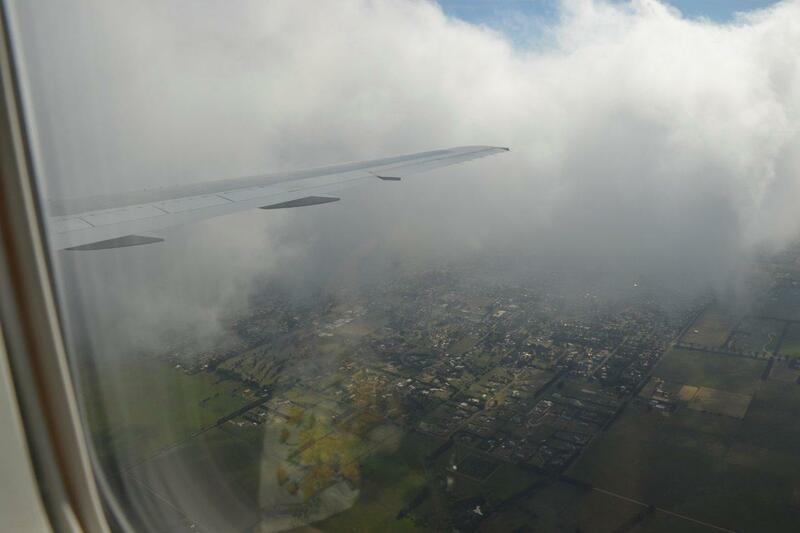 Plus the view of looking through clouds will never cease to enthral me! And then we were in Melbourne. It’s the second time we’ve landed there but the first time we’ve collected our bags and gone out of the doors. The other time was just a stop-over on the way to Hawaii and I’m so very sorry I never did write that story 🙁 The taxi driver was virtually a ‘no speak zone’ but we were content sitting in the back watching the journey and I was greatly relieved to find that he was not a part-time rocket pilot as most of our airport-to-hotel taxi drivers seem to have been in the past. It was 5pm by the time we got up to our room on the 21st floor of ‘Oaks on Market’ and the view was absolutely spectacular! We’d paid extra for a ‘view’ and it was well worth every penny. Or cent, if you prefer. 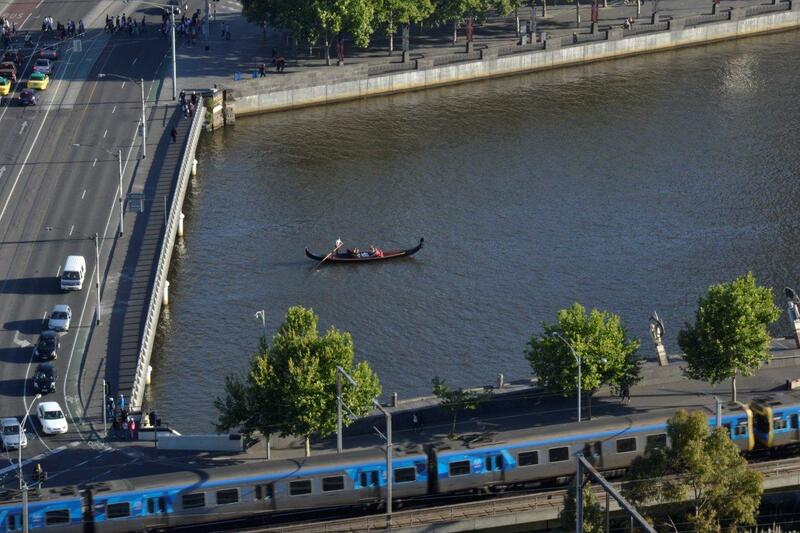 One shock was to see an actual Gondola being ‘poled’ along the river, exactly the way they are in Venice. It had to have been a true Venetian Gondola surely? I saw it a few times through the week. We were ready for some lunch, considering the meal on the plane had been at our usual breakfast time, and the little bit of toast at 6am had long since worn off before we were fed on the plane. So we decided to pop our valuables into the safe and David pushed too many buttons – or was it not enough buttons? – and then it wouldn’t lock. In fact it had completely taken offence and had taken up a constant beep, beep, beeeeeep LOL We hurriedly dialled 9 for reception, and they arrived very quickly and fixed it for us, as well as giggling with us about it happening. Phew! Nice staff makes such a difference to a hotel. 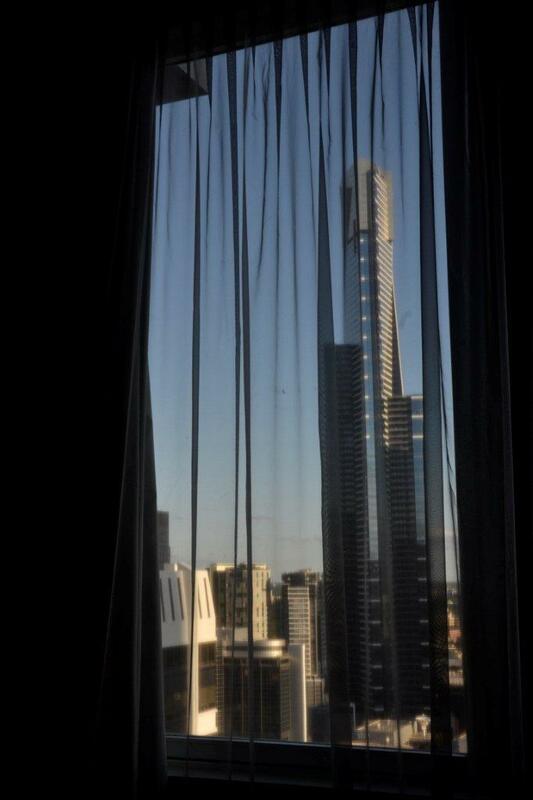 This, though we didn’t know it yet, was the Eureka Tower as viewed through our hotel window. We decided we were not in the mood for wandering around the city. We were a bit too hungry to risk not finding a suitable place to eat before we expired!!! 😉 So we decided we would eat in the hotel restaurant, but were very surprised to see it in darkness. On asking at reception they said that we could enjoy the same menu in the bar – so we did. We started with some cheesey garlic bread – I love garlic bread but could really live without the cheese – and we both had lemon pepper barramundi which was very nice indeed. Not a large meal, we were glad we’d had the bread as well, but satisfactory. Right, our tummies satisfied, we were *now* ready to go out exploring. It was almost dark, but it didn’t matter in the least. The obvious course was to turn left out of our hotel, down Market Street, to see if we could explore the area that we could see from our window, which we now know was Southbank, and the Southgate Shopping Centre. Imagine our surprise when we saw a horse drawn carriage crossing the bridge! The carriage was all lit up and the ponies had tall white feathers on their heads and it was all terribly grand and beautiful. Down the river side was a whole row of restaurants, all open on the side along the footpath and this area must have stretched for a few hundred metres. Plenty of choice that’s for sure! 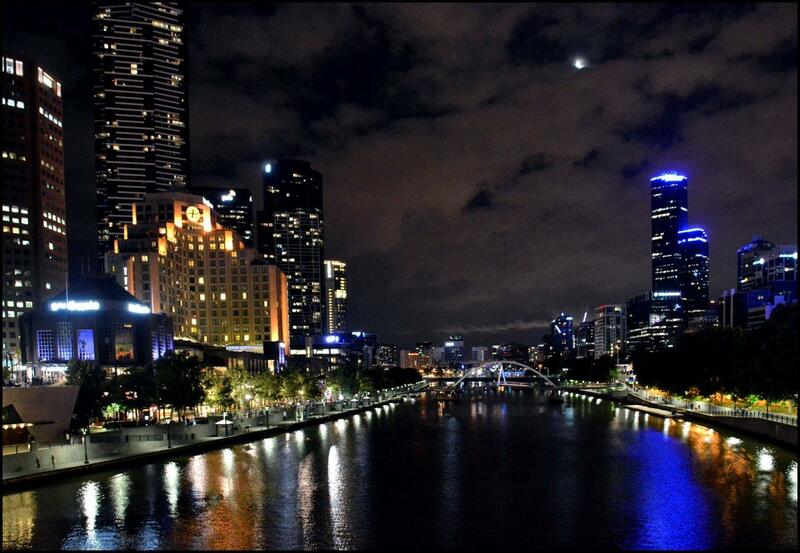 And the lights from the city reflecting on the water of the lovely Yarra River were such a picture. After trying three ‘711’ stores that we found along our meanderings, we managed to buy some honey in one, some margarine (yuk – we’re organic butter people usually!) and some soy milk in another and *finally* we found some bread in a third. Needless to say, David also found a bottle shop and got some wine. 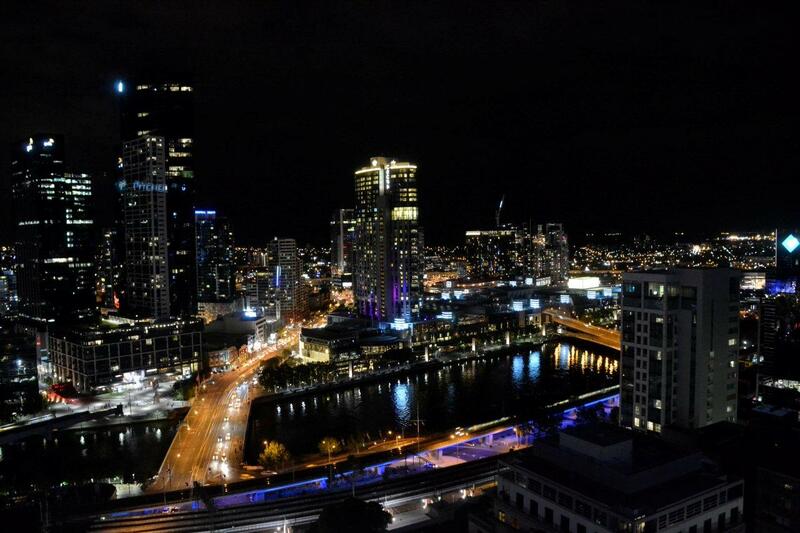 We eventually meandered back to our room and the view was even more amazing at night. I absolutely fell in love with it and we took to sitting in a darkened room with the curtains open to drink it all in. One of the buildings we could see out there had a letter ‘f’ on it. Nothing else, but it was the same font that Facebook use so I wondered if it was their building. There was also another tall building and we had a discussion about which was the tallest. Needless to say I was wrong, but that’s a story for tomorrow so I won’t tell you about it now. And then David tried to log in to the web on our tiny laptop but had no joy at all. We’ve never used our mobile web on that before and it did not want to know! We tried ringing the helpline but they said that there was a queue and they would ring us back on our registered phone number. Well *that*, my friend, is no use to us!!!! We have mobile internet so we can go away with it, not so we can sit at home next to the phone in case of problems. So we gave up. We did not want to wait on hold on our mobiles for half the night. Suddenly there was a noise outside and David looked up and saw a flash of light so we went to the window to see what was happening. 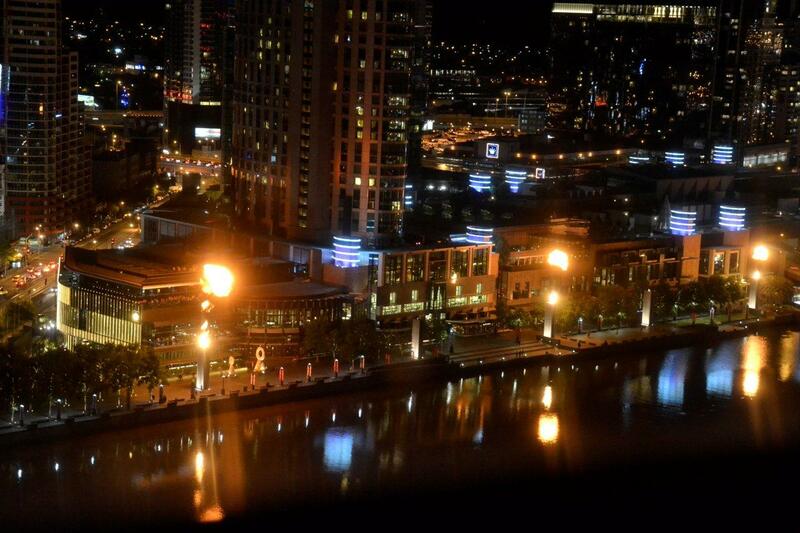 And there was another flash and a big fireball across the river to the right. It was accompanied by ‘crowd noises’ of awe and we realised that something was going on. It turned out that there were 7 tall towers over there, maybe 2 floors high each, and spaced about 10 metres apart in a long row, and what seemed to be timed fireballs were coming out of the top of them. I asked David the time and it was 9pm so we wondered if it was some form of clock – or at least a way of marking the hour, and decided to look out again in an hour’s time. Sure enough, at 10pm it happened again. 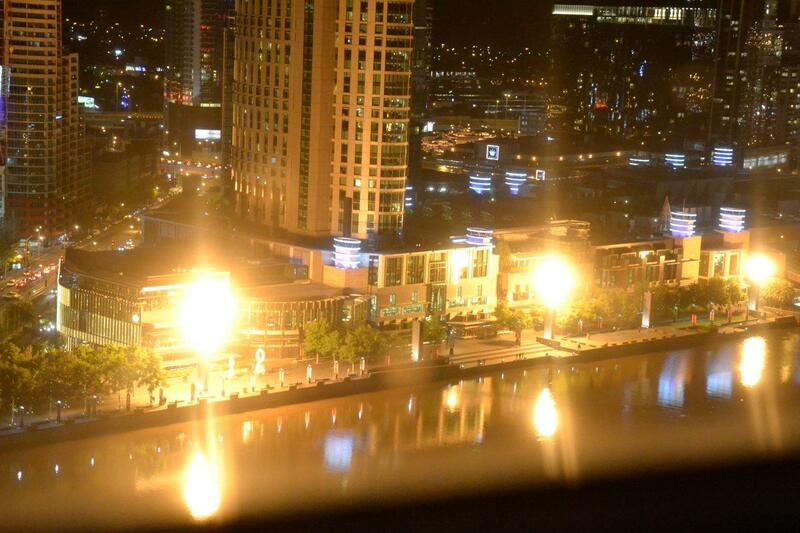 I went on the ‘net on my phone, (pah to iiNet LOL) Googled it, and discovered that it’s part of the Crown Casino and the flames are gas powered. Every time we saw the display it was different. It’s apparently run by a computer and as long as there are not high winds or a total fire ban it happens on the hour from 8pm to midnight each night. It truly was fascinating to watch and we couldn’t drag ourselves away every time we heard it. On one occasion I was even in bed but not sleeping so I leapt up to watch. And what front line seats we had to view it for the week! But the day was over. Even though we were 3 hours ahead and it was only 7pm in Perth (and we usually go to bed at 2am) we were tired, and snuggled up in a tiny corner of our truly massive, larger than king-sized bed. What a fab start! I love your travel tales and the photos are wonderful. Makes me want to pack my bags and travel with you! Aawww thanks Elizabeth! I’m so pleased you’ve managed to find time between all your excitements to have a look and a read. Maybe we’ll win the Lotto one day and take all our friends on a big holiday? Aawww thank you so much Barb, I’m completely delighted that you’ve enjoyed your read here. It’s a pleasure to have you along with us!